Atmospheric aerosol particles can undergo several types of phase transitions. Two types of atmospherically relevant phase transitions are efflorescence and deliquescence. 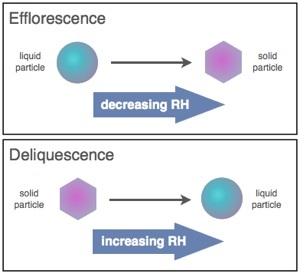 Efflorescence is controlled by kinetics since there is a free energy barrier to formation of solid nuclei, whereas deliquescence is controlled by thermodynamics. In order to predict the chemistry of atmospheric aerosols and the role of aerosols in climate one first needs to understand and predict these phase transitions. The phase and water content govern the total mass of airborne particles, the amount of light they scatter and absorb, and their reactivity. We are currently studying these phase transitions for a range of atmospheric condition to incorporation into atmospheric models. A wide range of instruments are being used for these studies including optical microscopy, FTIR microscopy, an electrodynamic balance. Optical microscope coupled to a flow cell. An optical microscope is coupled to a temperature and humidity controlled flow cell. 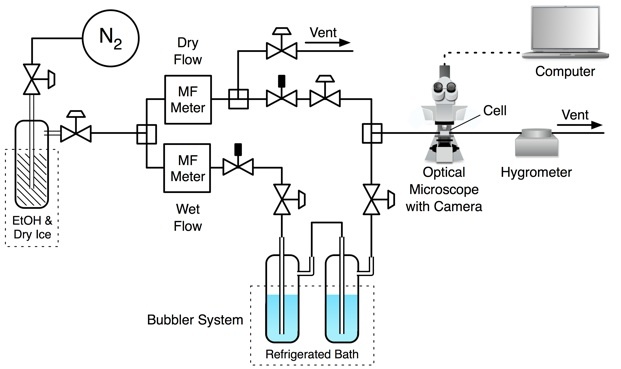 Particles are deposited onto a hydrophobic glass slide using a glass nebulizer and deliquesced at high relative humidity to ensure that all droplets are aqueous. The relative humidity in the cell is controlled and decreased slowly at approximately 0.1 %RH min–1. During this measurement, a CCD camera records phase transitions in the particles. FTIR microscope coupled to a flow cell. An FTIR instrument coupled to the flow cell provides additional useful information in deliquescence and efflorescence studies. 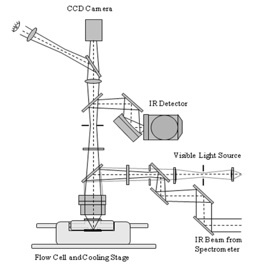 The diagram shows how such a system allows for the simultaneous image capture of particles (using a CCD camera) and the FTIR measurements of particles in the flow cell. The conditions required for freezing will be measured using an electrodynamic balance. The electrodynamic balance (EDB) is a double-ring electrode configuration with two end cap electrodes. It is based on the configuration used by the Agnes group at Simon Fraser University (SFU). Single droplets are created using a commercial droplet generator, and the droplets are charged by induction. Charged particles can be trapped and suspended at the centre of the balance for hours to days. Light scattering will be used to determine if a particle crystallizes while suspended in the trap. 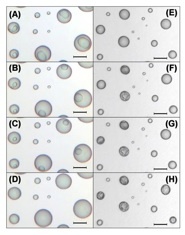 The images are of ammonium sulfate + malonic acid particles (xMal = 0.240) during deliquescence at relative humidities of: (A) 76.3%, (B) 77.2%, (C) 77.7%, (D) 78.2%, and during crystallization at relative humidities equal to: (E) 30.4%, (F) 29.3%, (G) 29.2%, (H) 28.1%. Bars indicate a distance of 10 μm.